Too many serious topics lately. Let’s have a little numismatic fun. It was a busy day. While I really wanted to go out for lunch, all I had time for was to go to the cafeteria in the building where I work to get something quick. After settling on something I went to pay handing the cashier a piece of paper with the portrait of Andrew Jackson. In the change returned were three quarters. Most of the time I will just drop the change in my pocket and check it out later. But on this day, I took a glance at the coins and something struck me. Well, it didn’t strike me but it looks like something struck one of my quarter. Twice! Closing my hands around the coins I walked away from the cash register and found a place I could stop to better examine what I had. Did I just find a rare double-strike quarter? Is it really an error? How much could it be worth? Putting down my lunch container, I opened my hand and found quarters. Not just one but three quarters. Three 2013 Mount Rushmore quarters. It was not a double-strike but the double-image of the side-by-side portraits that fooled me. And this happened more than once. If I take a quick glance at change that contains the Mount Rushmore quarters I get the impression that I found a double-struck coin. The Mount Rushmore quarter has to be one of the better designs of the America the Beautiful Quarters® Program. Rather than attempting to be a pretty postcard-like image of the place of honor, the design is more about the sculpting of the impressive monument. So be careful when glancing at your change. Those two faces side-by-side is not a double-strike or double-die. It is just a portrait of a portrait of George and Thomas being immortalized in granite. President’s Day is supposed to be the day that we celebrate the lives of the Presidents of the United States (POTUS). It became a holiday in 1968 when congress passed the Unified Monday Holiday Act (Public Law 90-363, S.cornell.edu/uscode/text/5/6103″ title=”5 U.S.C. 6103(a)” target=”_blank”>5 U.S.C. § 6103(a)) to standardize holidays on Mondays. Prior, most of the country celebrated February 22, George Washington’s birthday, as a holiday while some but not all states celebrated Abraham Lincoln’s birthday on February 12. The law made the third Monday in February the holiday. There are few traditions for the holiday except for sales by various retailers. Prior to the 1980s, many stores closed on George Washington’s Birthday. But amongst the first retailers to introduce George Washington’s Birthday sales were the automobile dealers. This was a time that the automobile manufacturers were going through a transition to more fuel efficient cars. Style was an issue since many began to look “boxy.” Seeing the success of increased sales, other stores followed and it has become rare to see a store closed on Presidents’ Day. Even with the Winter Olympic Games in progress, just going out for usual errands required patience as many people chose to partake in the usual weekend sport of shopping. Rather than get worked up, I decided that I would see what I could find in my change by paying using cash. I set out on Saturday and Sunday emptying my pocket of change along with my plans for the day. A stop at the gas station, where I admit to paying with a credit card, a proper beverage for the day (tall, 3-shot, extra hot, skim latte), and a stop at the bank for cash, I went on my way. After two days of paying in cash, I counted my change. While collecting almost $18 in coins, I was surprised to find nothing remarkable. There were a few copper (pre-1982) Lincoln Memorial cents, but nothing that would give this post an interesting climax. However, there was on interesting omission: no 2014 coins. In the half-dozen shiny, very red cents I found, all were 2013 cents except for one dated 2012. Those very shiny nickels were almost all dated 2013-D and there were no dimes newer than 2011. Similarly, the only of the National Parks quarters I found was a 2013 Fort McHenry quarter. I also found three very shiny 2009-D Guam quarters and a mix of other circulated state quarters along with two pre-1999 quarters with the eagle reverse. Under the guise of “A penny saved is a penny earned,” the entire lot was put into a container that sits on top of my dresser. When the container is full or in December, whichever comes first, I will bring the coins to a bank’s coin counter and donate the money to a worthy cause making the weekend’s activity worth something. On Monday, September 12, 1814 the British invasion fleet landed at North Point in Baltimore and tried to capture Baltimore by attacking Fort McHenry. Before the attack on Baltimore, the British marched through Washington, D.C. and burned the capital building. On their march to Baltimore, the British took Dr. William Beanes as a prisoner for his role in capturing British stragglers and deserters. Beanes was imprisoned in Baltimore as the Royal Navy gathered forces for their attack on Fort McHenry in Baltimore Harbor. Word of Beanes’s capture reached Francis Scott Key, an accomplished lawyer, prosecutor, poet, and friend of Dr. Beanes. Key, who was known as a skilled negotiator and a very temperate man, was asked by the Army to accompany prisoner exchange agent Colonel John Stuart Skinner to Baltimore to secure the release of Dr. Beanes. On September 7, 1814, Key and COL Skinner dined with British officers abroad the HMS Tonnant to negotiate the release of prisoners. Although Beanes was released, the British would not let the men leave the ship because they had heard about the British plans to attack Fort McHenry. Key, Skinner, and Beanes watched as the Royal Navy bombarded the fort and surrounding areas of Baltimore. As the smoke cleared on the morning of September 14, 1814, after 25-hours of bombardment, Key was able to see the U.S. flag still flying over Fort McHenry. Key was so moved by the sight that after returning home, he wrote the poem “The Defence of Fort McHenry.” The poem was published in the Baltimore Patriot on September 20, 1814. Following the War of 1812, Baltimoreans celebrated the victory every year on September 12 but did not gain statewide recognition until the centennial celebration in 1914, even though the celebration was overshadowed by World War I. Celebrations waned during the Great Depression until it became an official holiday in 1957. Defenders Day would become popular again in the 1980s with the help of the National Park Service and the Fort McHenry Guard. Obverse of the Fort McHenry Commemorative Medallion for sale at the gift shop. Reverse of the Fort McHenry Commemorative Medallion for sale at the gift shop. This year, Defenders Day was celebrated on Friday, September 13. With a crowd of area students, area residents, dignitaries, and members of the Maryland State Numismatic Association, the Defenders Day celebration kicked off at Fort McHenry with the launch ceremony of the Fort McHenry National Monument and Historic Shrine quarter. With Ranger Bailey as the master of ceremonies, the program features Park Superintendent Tina Cappetta, Maryland Senator Ben Cardin (D), Representative John Sarbanes (D) whose district includes Fort McHenry, Representative C.A. “Dutch” Ruppersberger (D) whose district covers parts of Baltimore not in Sarbanes’ district, Baltimore Mayor Stephanie Rawlings-Blake (D), and Treasurer of the United States Rosie Rios. Speeches were interspersed with a performance from the Notre Dame Prep (Towson, MD) Choir, ceremonial drills from the Fort McHenry Guard, and the Fort McHenry Fife and Drum Corps. Prior to end of the ceremony, Treasurer Rosie Rios presented a special plaque with examples of the Fort McHenry Quarters to Superintendent Cappetta. The ceremony ended with the dignitaries on the stage pouring a bucket of quarters into a old ammunition box. Following the ceremony the dignitaries handed out quarters to to the students who sat through the ceremony. These children were attentive and appreciative of the ceremony and the quarter. Clearly, the most popular person giving out quarters was Mayor Rawlings-Blake of Baltimore. Rawlings-Blake is a native of Baltimore, mother, and younger than the other politicians in attendance. It was clear that she connected better with the students than the other politicians. After the quarters were handed out, the students toured the park visiting the various stations setup to teach them about why Maryland celebrates Defenders Day. On my way out of the park, I made the obligatory stop in the gift shop. Surrounded by students having fun looking at the items for sale, I found a card issued by the National Park Service with the Fort McHenry quarters commemorating the fort. The back of the card says that a portion of the proceeds are donated to the National Park Conservation Alliance. I also purchased a commemorative medal with a hologram on both sides. The images on the obverse commemorate the Star-Spangled Banner while the reverse shows the fort. Not a bad way to spend the morning in Baltimore before having to return to work. All images owned by the author. 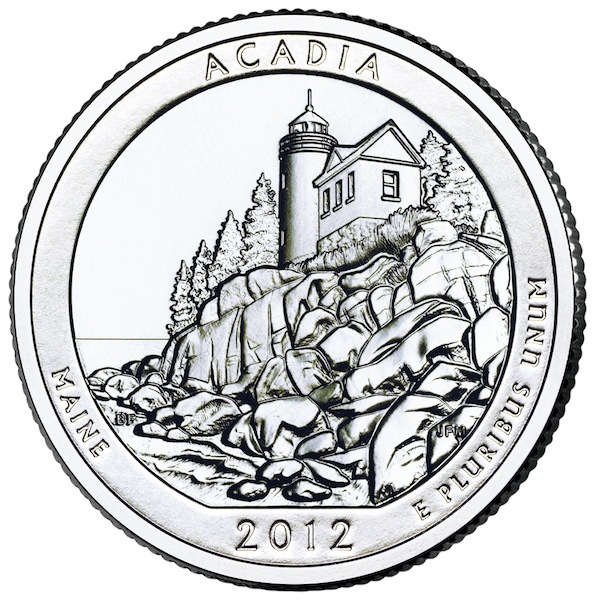 If you are going to be in the area of Acadia National Park today, June 26, the U.S. Mint will hold the launch ceremony at 9:30 AM at the Hulls Grove Visitors Center, Bar Harbor, Maine. Rolls of the newly-minted coins, which feature an image of Bass Harbor Head Lighthouse, which, ironically isn’t actually in the park, will be available for sale. For those who like video, and who doesn’t, the following is B-Roll footage from the U.S. Mint including a few seconds of U.S. Mint Sculptor and Engraver Joseph Menna working on the design of the coin using a computer. Coin was designed by Artistic Infusion Program Associate Designer Barbara Fox. This week, the U.S. Mint branch in San Francisco opened its doors for the press in honor of the facility’s 75th Anniversary. Reporters were given a tour of the production lines and spoke with employees of the U.S. Mint about upcoming collectibles. The U.S. Mint has clearly increased production to meet a potential demand for the American Silver Eagle Proof set with both regular proof and reverse proof coins for the upcoming sale. In the video we see a lot of silver planchettes and a few racks of beautiful silver coins. A pair are shown to the camera including the reverse of the reverse proof. We also learned that the San Francisco Mint is striking circulation quality (business strikes) National Parks Quarters that will be distributed in special collectibles. These coins will not be added into circulation. San Francisco Mint Plant Manager Larry Eckerman made an unfortunate mistake when he said that there has not been any S mintmark coins in circulation since the early 1950s. Collectors of Lincoln Cents can tell you that S mintmark cents were issued starting in 1968 through 1974. The 2012 American Eagle San Francisco Two-Coin Silver Proof Set goes on sale starting June 7, 2012. Coins will be minted to demand based on sales through the end date of July 5, 2012. Price will be determined prior to sale and based on the cost of silver. Here’s to hoping that silver prices drop between now and June 7! Video courtesy of KTVU San Francisco. Glacier National Park is located in northwest Montana named for its prominent glacier-carved terrain. The rugged terrain has been a favorite for hikers and photographers. In 1895, Chief Whit Calf of the Blackfeet tribe sold the land to the United States government for $1.5 million with the provision that the Blackfeet could continue to hunt on the land and that the land be made public land. By 1910, President William Howard Taft signed the bill that made the land a national park. The Glacier National Park Quarter was the second of 2011 and the seventh in the America The Beautiful Quarters Program. According to the U.S. Mint, 31.2 million Glacier National Park Quarters were struck in Denver and 30.4 million were struck in Philadelphia. Prior to that, 347 million quarters were produced in 2010 and 61.2 million Gettysburg Park Quarters were produced prior to Glacier National Park. After all this production and over a year-and-a-half into the program, I received my first National Parks Quarter in pocket change. The quarter was given to me in a local grocery store after an early evening venture to fill the pantry. I was pleasantly surprised to see finally find one in change. I also was able to take two 2010 Native American Dollar Coins from the cashier as part of my change. I will spend them over the weekend hoping they will continue to circulate and not end up back in the Federal Reserve’s coin room. I have not seen the five-ounce America the Beautiful Silver Bullion Coins. Aside from rarely seeing the circulating versions, I have no desire to purchase a five-ounce silver coin, especially from a series that does not inspire me. What does inspire me is watching what the U.S. Mint has to go through in order to strike these coins. For those of us who love to watch how this works, the U.S. Mint’s YouTube channel has a video showing the production process. Imagine what it takes to strike these coins. According to the video, the U.S. Mint strikes the 3-inch planchettes twice with 430 tons of force. I also did not get the impact of the planchette size until I saw the video. I also did not know about the edge lettering and that there were two different versions—a reverse proof-like as the bullion version and a matte finish for collectors. The reverse proof-like coins are beautiful. I wish they would do this with the regular proof coins because it would make a great collectible series. Olympic National Park in Washington is one of the most unique National Parks because of its biodiversity. There are three distinct ecosystems in just under a million acres: sub-alpine, coastal, and forest. Cool weather and rain are regular weather indicators that makes it very comfortable to visit during the summer as long as you remember your rain gear! Catching up a bit, the U.S. Mint introduced the first 2011 coin in the America the Beautiful Quarters Program to honor Gettysburg National Military Park. The event was held at the park’s Museum and Visitor Center and was hosted by U.S. Mint Director for Sales and Marketing B.B. Craig; Gettysburg National Military Park Superintendent Bob Kirby; and Barbara Finfrock, vice chair of the Gettysburg Foundation. The Battle of Gettysburg, the Union victory in the summer of 1863 that ended General Robert E. Lee’s second and most ambitious invasion of the North, was a turning point in the Civil War. Often referred to as the “High Water Mark of the Confederacy,” it was among the war’s bloodiest battles. It also provided President Abraham Lincoln with the setting for his most famous speech. Established by concerned citizens in 1864, the Gettysburg Battlefield Memorial Association set out to preserve portions of the battlefield as a memorial to the Union troops that fought in the battle. In 1895, the land was transferred to the federal government and Gettysburg National Military Park was established.